For a microcosm of the Thai capital, head to its largest market. Bangkok: broiling heat, street food, shopping. This may sound like torture for some. But for others, these factors amount to a kind of paradise best experienced in the Thai capital. These elements – along with plenty of smiles – can be found in abundance at the city’s most famed bazaar, Chatuchak (or Jatujak) Weekend Market. Every Saturday and Sunday, more than 200,000 visitors weave through Chatuchak’s aisles, where they spend an estimated $750,000 at a total of 8,000 stalls spread across 35 acres. It comes as no surprise to learn that the emporium is among the largest in the world. While shopping is the name of the game, many foodies head to the market just to sample the goods from its vast array street food stalls. While the market may seem like a labyrinthine mess at first pass, there is order underlying the seeming chaos. A main artery encircles the market, which veers off into a series of numbered sidestreets – Soi 1, Soi 2, Soi 3, ad infinitum, or so it seems. These alleyways are then grouped into a total of 27 sections within which all manner of goods can be found. A video of the mayhem can be seen here. At first glance, the stalls seem to overflow with mass-produced Hmong fabrics, teak furniture, and embroidered crafts. Or, how about “six-inch crushed velvet stilettos, a pampered puppy, a fake Fendi, a set of Beatles cushion covers, (or) a shark’s-tooth amulet”? All of this and much more can be found at Chatuchak. While the goods are scattered throughout the market with no regard for order, the categories of items on sale include no less than the following: clothing and accessories, handicrafts, furniture and home décor, food and beverages, plants and gardening tools, art and gallery, pets and pet accessories, books, antiques and collectibles, miscellaneous and vintage apparel. A breakdown of which sections these sundry items can be located within Bangkok’s greatest bazaar can be seen here, with a map of the market here. With so much to choose from, a quick list of must-see shops is a good place to start. Kinnaree Silk and Linen – one of the few air-conditioned booths – offers an excellent selection of silk women’s wear for all occasions for 1000 baht ($32) to upwards of 5000 baht (Section 9, Soi 18). For fans of bags crafted from multihued cow hide, Guate Leather offers an excellent selection of finely crafted, limited edition handbags, big and small, in a rainbow of colors (Section 24, Soi 33). For those with an edgier fashion sense, a trip to Masque & 17:09 does not disappoint. Polka dots and paint splattered designs adorn the casual wear at this shop, for both sexes. Other noteworthy shops to explore include Anyadharu – scent-infused bath and body products (Section 3, Soi 3) – and Backyard Jewellery – offering what the name suggests (Section 4, Soi 2). Travel + Leisure offers another list of stellar shops here. 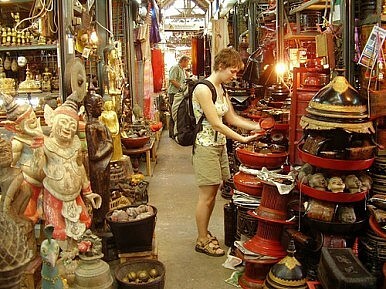 Caveat emptor: Antique hunting is a risky undertaking at Chatuchak, where fake merchandise is not uncommon. Shoppers must be prepared to walk away if prices seem off. Given the tropical heat, it’s also a good idea to wear light, comfortable clothing, walking shoes, sun protection and bottled water. Further, cash is the preferred medium of exchange – ATMs are often spread far apart and most vendors do not take credit cards. A final note: it’s worth showing up in the morning before the heat and crowds overtake the market grounds. If all of this sounds overwhelming, Lonely Planet offers some basic advice. Rule number one: know where you’re going. Those 27 sections can begin to feel like a labyrinthine Moroccan souk if you don’t have a game plan. Rule number two: if you love it, buy it. Things are snatched up quickly at Chatuchak. Don’t hesitate. Just buy it if you feel you must. Rule number three: learn to love bargaining. Just be sure to do it the Thai way – with a smile. For information on market access and hours, visit here.